A Median Auction Stakes over 51/2f on good going. Nine two-year-olds declared. I've not got a great deal of time so I will keep this to the basics. Dontgiveuponbob looks to have bold claims. Richard Fahey's charge, a son of Pastoral Pursuits, ran well on debut when in need of the race. The form of that contest has been franked. This bay colt then made his second start in a valuable maiden at York. Dropping down to an auction race gives the impression connections have found a winnable race. 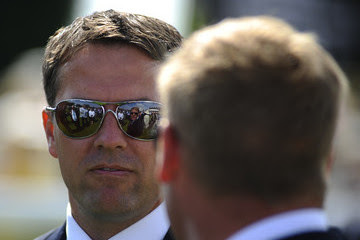 Magnus might be a fair each-way alternative if the favourite is backed to a silly price. This son of Makfi finished last on debut at Ripon when not unfancied in the betting. Tom Dascombe's horse was sent off 20-1 next start at Redcar when stepping up in distance. He finished sixth of fourteen, beaten under five lengths. The form of that race has worked out well at this level. If slightly forgotten in the betting, there is a fair chance this horse will either be backed or he will run respectably at big odds. No time to write a detailed post so this starts and ends with these two horses. Conclusion: To be honest, Dontgiveuponbob is going to take a lot of beating. However, the old saying of not to be frightened by one horse often rings true. They still have to run their race which isn't always as easy as going through the motions. It may well be the case but there are no guarantees. Magnus' form, being ninth and sixth, doesn't look that great on paper but that second start deserves respect. I would be hoping that the favourite starts at short odds-on and this horse drifts to big prices on the exchanges. It might be a wise decision rather than betting each-way to place a cover bet on the favourite at 8/11 (if lucky bigger) and put a few shillings on Magnus at big prices on the win market. If the favourite wins no loss and if Dascombe's charge springs a surprise it will be a day to remember. The favourite will go well so you may have to pray for a disappointment.